This delightful garden at Gresgarth Hall has been created by the renowned garden designer Arabella Lennox-Boyd. 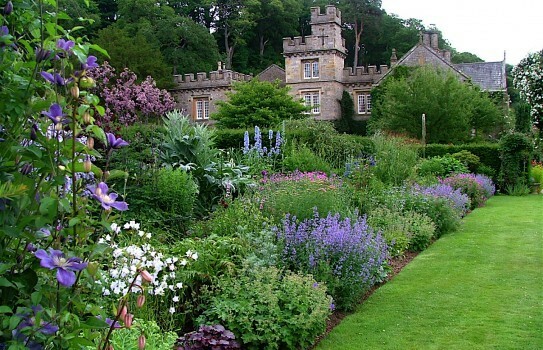 The garden at Gresgarth Hall includes terraces, lake, small bog garden, a wild garden, extensive kitchen garden, a bluebell wood, the millennium wood, the rhododendron hillside, herbaceous borders, and a serpentine walk. There are many different plants, shrubs and trees to see including many moisture loving plants, ferns, acers, lilacs as well azaleas and magnolias. Modern and classical sculpture is displayed throughout the Gresgarth Hall garden. If you want to take a break Gresgarth Hall and Garden, why not stay in one of our recommended hotels. Each hotel has genuine guest reviews enabling you to book from anywhere in the world in total confidence. Look now - click here.